There were no injuries, other than to the bomber, the official said. Chinese security personnel stand outside the U.S. Embassy, in the background, after a reported blast occurred nearby in Beijing, Thursday, July 26, 2018. "There was an explosion at approximately 1 p.m. today in the public space off the South East corner of the Embassy compound," the spokesperson told NBC. "According to the Embassy's Regional Security Officer, there was one individual who detonated a bomb. Other than the bomber, there were no injuries. The local police responded." 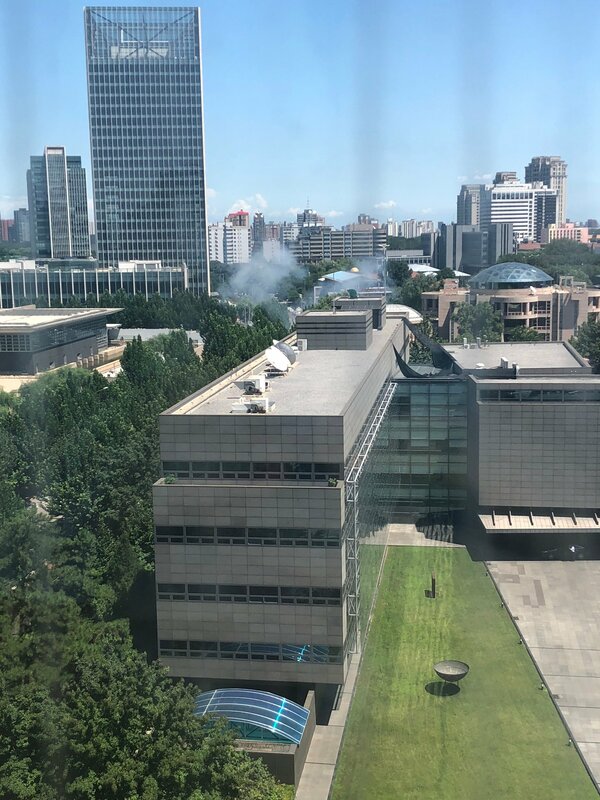 Smoke rises from an apparent bomb detonation outside the U.S. embassy in Beijing. Credit: Gareth Lacey. Chinese media outlet Global Times reported on Twitter that a witness said police took away a woman "spraying gasoline on herself" outside the embassy around 11 a.m. The state-run outlet said in a subsequent Twitter post that it was not "proved yet" that the incident was connected to the explosion near the embassy that occurred later. Despite that earlier altercation, local media reported that a Foreign Ministry spokesperson said the afternoon's explosion was an isolated incident. A witness told Reuters they saw Chinese police examining a vehicle outside the embassy, and another witness said there were seven to eight police vehicles near the embassy and the road next to the complex had been closed off. Images and videos posted on Twitter showed a large amount of smoke and what appeared to be police vehicles surrounding the vast structure in northeastern Beijing on Thursday afternoon. Police did not immediately respond to the incident, the Associated Press reported.